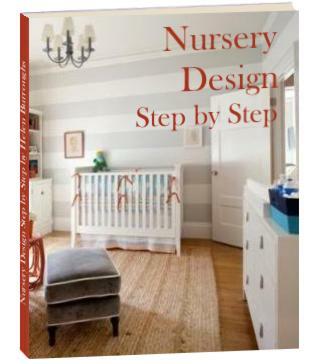 Your Best Source of Twin Nursery Design Inspiration! Lots of Twin Baby Room Pictures Including Pictures Submitted By Our Readers and a Celebrity Baby Nursery or Two! Are you looking for twin baby room decorating ideas? Then you've come to the right place! This page is packed with cool nursery pictures to stir up your own creative juices. This baby room idea was sent to us by Anne-Marie Cox from Perth, Australia. You can read more about this Zanzibar nursery for Austin and Albert here. 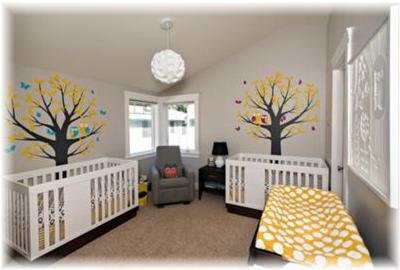 This nursery design was sent to us by Lindsay Heller from Lancaster, PA, USA. You can read more about this pink twin nursery here. 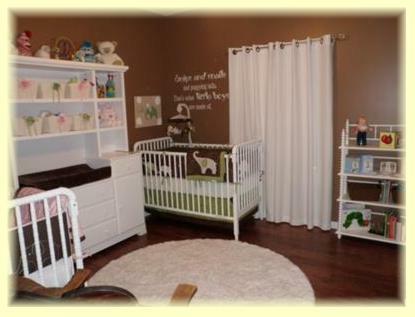 This twin baby room decorating idea was sent to us by Melissa from USA. You can read more about this pink and blue nursery idea here. 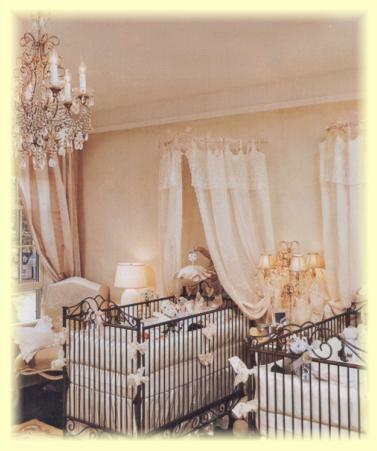 This twin baby room decorating idea was sent to us by Nancy from Washington, USA. You can read more about this gender neutral nursery for twins here. 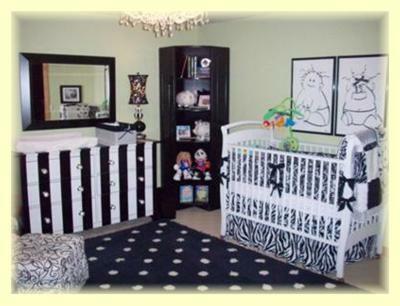 This twin baby room decorating idea was sent to us by Kasey from Chicago, USA. You can read more about this black and white nursery for twins here. 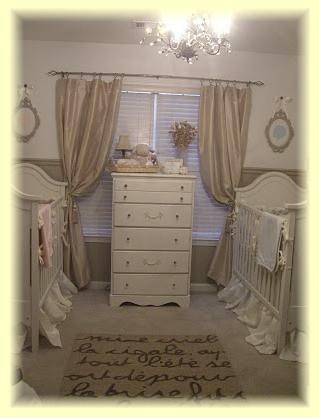 This twin baby room decorating idea was sent to us by Mandy Stribling from Nashville, TN, USA. You can read more about this serene baby room for twins here. 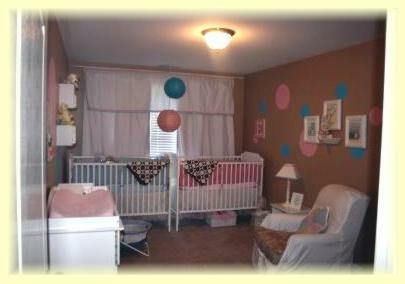 This twin baby room decorating idea was sent to us by Monica Fields from Hurley, MS (Gulf Coast), USA. You can read more about this elegant elephant nursery for twins here. 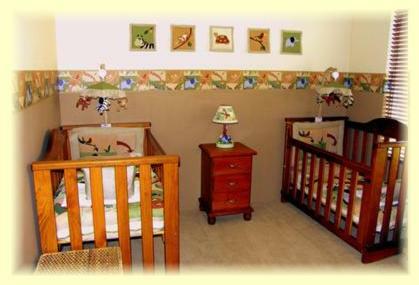 This twin nursery design was sent to us by Silvia Delgado from Albuquerque, New Mexico. You can read more about this monkeying around nursery for twins here. 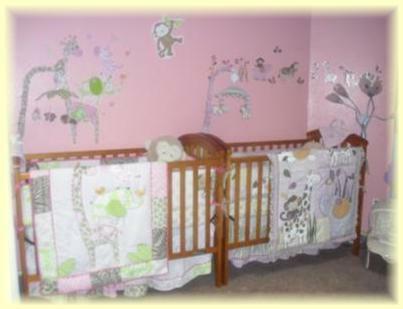 This beautiful nursery for twins was sent to us by Marcy from Seattle, WA. You can read more about this Woodland nursery for twins here. Let's start with the famous J Lo Twins boudoir. Emme and Max started life the way their parents intend it to continue - in the lap of luxury! It's beautiful and I love the Bratt Decor Casablanca cribs but I think if I were Emme or Max I'd be absolutely terrified of spitting up in here! Brooke Burke had this nursery designed for her 13 month old daughter, Heaven Rain and her new baby boy. She chose to define the gender of the two Venetian Bratt Decor cribs by using matching blue and pink bedding and attaching coordinating blue and pink drapes to the canopies. Ricky Martin had an airplane-themed nursery built for his twin sons Matteo and Valentino. Check out that light! I have to admit that I'm not sure about the rug but I love the built in shelving opposite the Netto Collection Moderne Cribs. 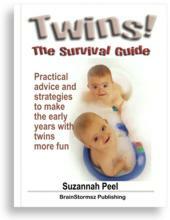 Great for the extra storage you need with twins. Marcia Cross and husband Tom chose a serene lilac nursery for their twin girls, Savannah and Eden. The nursery is outfitted in the gorgeous Bratt Decor Manhattan furniture collection. The gliders and window treatments are in fabric coordinating with the crib bedding, which differentiates the two crib spaces. One is done in sage while the other is in pink blush. This baseball themed celebrity baby nursery is home to Max and Bob, twin sons of Brooke and Charlie Sheen. I love how traditional blue softness is combined with the modern crispness of the Bratt Decor Blu Collection nursery furniture. 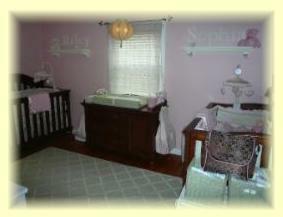 I hope these twin nursery room pictures gave you some ideas and inspiration for your own nursery design.